The Cafe Cup is incredibly simple. It resembles the little single serve cups that you buy in the store, except that they are empty: Just fill up the cup with the ground coffee (your choice!) 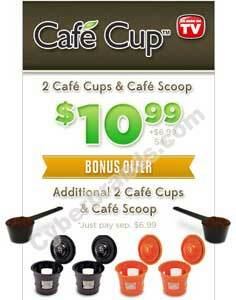 using the scoop that comes with your Cafe Cup set, snap the cup lid back on and insert into your coffee maker. In minutes, you’ll have a freshly brewed cup of coffee, all for as little as a nickel a cup! The cups are also BPA-free so they are safe for you to use and won’t leech harmful chemicals into your coffee. Your coffee is fresher: Grind your beans right before brewing, and you’ll have the freshest coffee you can get! Save money over buying pre-packaged single serve coffee cups. Choose your brand: You aren’t limited to the brands that offer their coffee in single serve cups, nor are your limited by your store’s selection of single serve coffee cups. Make your own blend: Want half-caff coffee? Just blend half decaf, half regular coffee and add to your Cafe Cup! Add fresh spices, if you like, for a healthy gourmet cup of coffee. Yes, you can make tea with Cafe Cup! A Cafe Cup set includes cups in two different colors. Use the colors to keep track of decaf and regular coffee. Or, use one color for tea, the other for coffee. This prevents flavor transfer from one beverage to the other. No more waste. Just keep reusing your Cafe Cups.